TACOMA — After posting a 3-0 win over Lane in opening round NWAC Championship Volleyball action, the Warriors were eliminated from the tournament with two loses in Friday action. WWCC opened Friday in the quarterfinals, but were dropped into the losers bracket by Edmonds. The Tritons had too much on this day as Edmonds swept the Warriors, 25-13, 25-17, and 25-17. The Tritons diverse attack of Michelle Dmitruk, Zarya Smith, and Sadie Gardener sparked the Tritons to the sweep. Dmitruk led the way with 15 kills. Smith added 11, and Gardner chipped in 10. Tylar Jones led the Warrior attack with eight kills. Morgan Ness contributed seven kills. Abbey Schwager put up 22 assists, and on the return side, Kacey Halbert came up with 21 digs. It wasn’t enough as the Warriors dropped into an elimination match with North Idaho. North Idaho survived Thursday’s opening round by pulling out a 2-0 win over Bellevue after being defeated 3-2 by Linn-Benton in the Cardinals opening tournament match. The Warriors dropped the first set 25-17 but fought back in the second set, but North Idaho had enough to hold off Walla Walla 25-20 and end the Warrior season. The win sent the Cardinals into Saturday consolation round play. In Friday action, Kayla Neumann’s nine kills led the Cardinals to the 2-0 win over the Warriors. Emmah Peterson led the Warrior hitters with seven kills and Schwager ran the offense with 16 assists. Halbert led the Warrior returners with 13 digs. 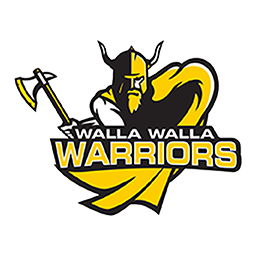 Walla Walla finishes the season with a 33-7 overall mark and its appearance in the NWAC Championship Tourney.